Our goal… Is to help you with your musculoskeletal problems and to maintain a better balance in your Life! Dr. Young was selected as one of St. Louis Magazine’s 2015 TOP CHIROPRACTORS!! Dr. Young offers a range of health and wellness services which include chiropractic care, acupuncture, cold laser therapy, ergonomic evaluations, nutritional counseling, injuries from automobile accidents, pain management and auriculotherapy. Since 1988, Dr. Young’s old South City practice continues to grow. The office is located on Hampton Avenue, just south of Fyler. It is easily accessible if you live in the City, Maplewood, Affton, Richmond Heights, Webster Groves or Clayton. The office is wheelchair accessible. Dr. Nancy Lee Young grew up in Union, Missouri. She earned her BA degree in History at Newcomb College of Tulane University in New Orleans. 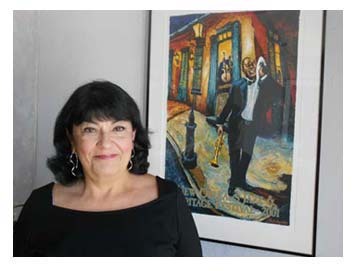 She continued to live and work in New Orleans while fulfilling her science requirements at the University of New Orleans. Dr. Young returned to St. Louis to continue her studies and to manage ORPRO, an art wholesale distributorship. In 1988 she graduated from Logan College of Chiropractic. In 1995, Dr. Young became board certified in Acupuncture by the State of Missouri. Dr. Young helped implement chiropractic and acupuncture for the St. John’s Mercy Center for New Health Options in St. Louis County. She has been a presenter for Microlight in the discussion and teaching of low level laser therapy. And, was a participant in the investigational study on the “effects of low level laser therapy on pain management and soft tissue trauma” which allowed the low level laser to be approved by the FDA in 2002. As of 2014, Dr. Young is a Board Certified Medical Examiner for the Federal Motor Carrier Safety Administration. Please follow Young Chiropractic & Acupuncture Center on Facebook, and check us out on Yelp, Angie's List, Four Square and Wellness .